Today we visited Otterford Lakes to see the bluebells in full bloom. As we walked through the woods, you could see the shades of blue on the ground below the dappled trees. As we walked further down hill we could see the swans on the lake. We walked past the bridge over the lake and up to the higher meadow where there was an absolute carpet of bluebells, really lovely. I took some views of the lake as we walked back down. Some white narcissus were still blooming. The pink Campion flowers were coming out too. I made all my hanging baskets up myself this year and I am very proud of them. They are full of colour and just lovely at the moment. I particularly like the half moon baskets with their pink trailing geraniums and colourful lobelia. The hanging basket near our Lodge House sign is one of my favourites. I have several pots of plants around the front patio and many of them are full of colour too. I wish the vegetable garden was as well ordered, unfortunately the weeds are winning there at the moment so more work needed!! Yesterday I went to a flower arranging at a local village hall. The idea was to make a country basket brimming with flowers. Firstly we watched a demonstration, then we were able to have a go ourselves. The first stage is to cut then soak the oasis. To soak it you just pop it into cold water and without touching it, let it fill with water and change colour to dark green. Then you take it out and place into the basket, but first chamfer the edges so you create a larger area into which to push the flowers. Next you gradually add the greenery all the way round and also in the middle. You need lots of foliage to give a basis for the flowers to sit on. I then started added the delicate flowers such as Campion and Ox Eye Daises into the foliage. Next I added the peonies. And lastly, a rose, the gerberas and chrysanthemums to fill it with flowers. Here’s a view from on top. I have never done anything like this before so was quite pleased with the results and found it quite easy so will be able to do it again in the future. 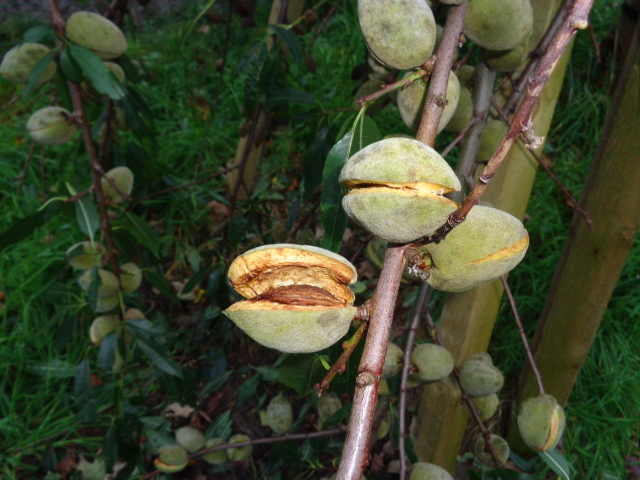 Our Almond tree groaned with the weight of the nuts it had produced and then one heavy limb broke off. 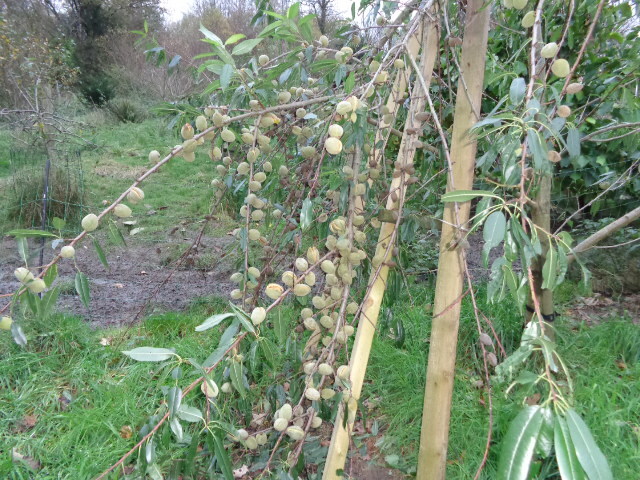 We propped it up the best we could and hoped the nuts would still ripen. 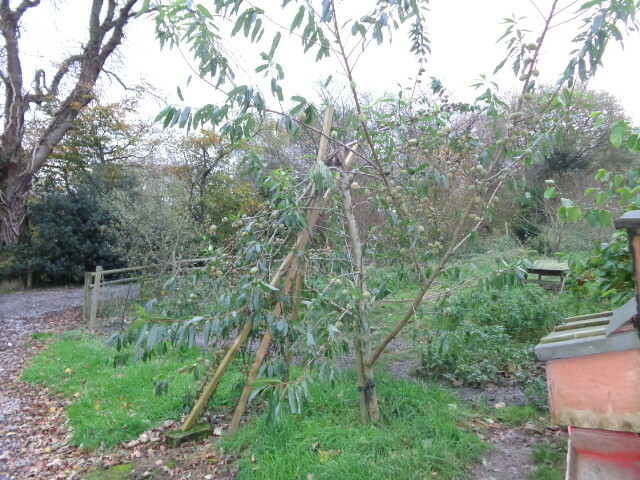 The branch that had snapped seem to have more nuts than any other. The outer casing was starting to crack open on a lot of the nuts, revealing the shell of the actual nut inside. This afternoon I have picked two big pots full and will dry them out and then crack off the outer casing. We will have our own nuts for Xmas!! Although we have a big garden we do not yet have a greenhouse or a polytunnel, they are on my wish list!! 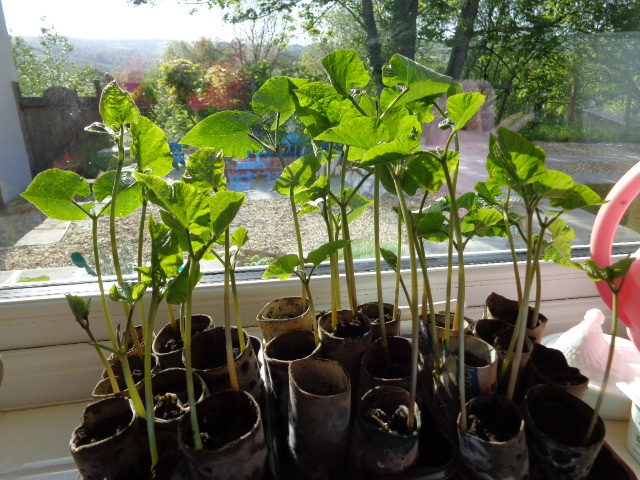 So when I sow my runner beans I always have to do it indoors. I save up all the cardboard inners from toilet and kitchen rolls, cut the kitchen roll inners into two to make the right size and fill them with grow bag compost. 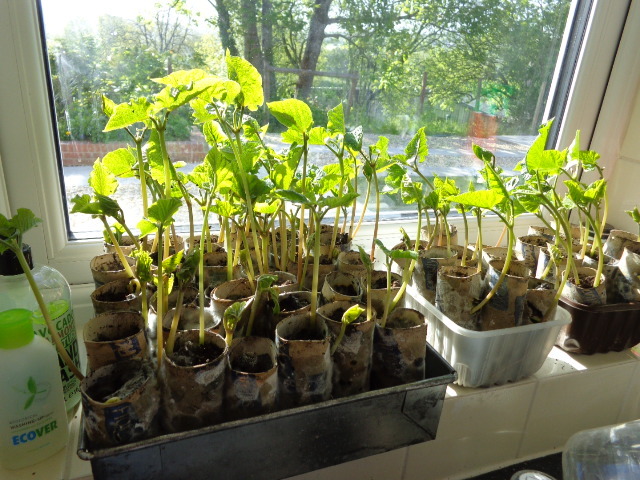 I place two runner bean seeds into each tube, add a little more compost and water. I then placed the tubes on our new kitchen window sills which place West so catch the afternoon/evening sun. This is what they look like after 11 days growing on the window sills. When the plants are about a foot tall I will put them outside into the ground. I plant the whole tube by each bean pole thus not disturbing the roots and giving the plants a fighting chance against the slugs that would have the growing tips off in an instant. We have found this method to be very successful over the past few years, hence repeating it this year.